The Bull’s Run Nature Sanctuary and Arboretum’s Board of Directors is pleased to announce the selection of the new naturalist, Erin Skimming. After reviewing several applications submitted and meeting with the candidates, Erin was chosen to replace Barb Reuss. Erin is studying Environmental Engineering Technologies at Cincinnati State Technical and Community College. 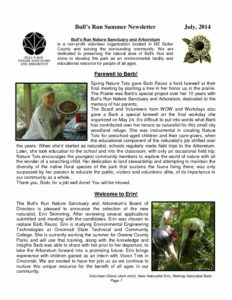 She is currently working the summer for Greene County Parks and will use that training, along with the knowledge and insights Barb was able to share with her prior to her departure, to take the Arboretum forward into a promising future. Erin brings experience with children gained as an intern with Vision Trek in Cincinnati. We are excited to have her join us as we continue to nurture this unique resource for the benefit of all ages in our community. The Summer 2014 Newsletter is now available to read online.